Scotland could lose one of its six surviving infantry regiments in a major defence shake-up, according to a Conservative MP. Patrick Mercer, the party's spokesman for homeland security, said he has seen a leak of a government white paper to be published this autumn. The MP for Newark said he had been told that up to five infantry battalions across the UK were facing the axe. Mr Mercer said that meant one of Scotland's infantry regiments was under threat. Scottish politicians have called for the launch of a cross-party campaign to save the Highlanders - the regiment seen as the favourite to be scrapped. However, the Ministry of Defence said it would not comment on speculation. Mr Mercer claimed units north of the border were particularly vulnerable under the review because of widespread under-manning. The former soldier blamed the government, which he said had allowed recruitment to slip. Mr Mercer said: "If the army looks at sustainability then clearly all of the Scottish regiments are deeply, deeply threatened. "For instance, the Highlanders recognise they are 15 under-strength when in reality they are more than 100 under-strength because they are made up with so many Gurkhas." He told BBC Scotland that the army was already stretched to "breaking point". Mr Mercer said the white paper would leave the Ministry of Defence with a choice between manpower and expanding equipment programmes. "I think that manpower is going to lose while more expensive equipment is bought," he said. An MoD spokesperson said the white paper was still under development and would be published in the autumn. 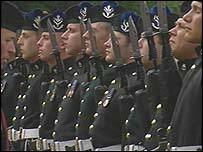 There are currently 2,874 soldiers serving in the six Scottish regiments, a shortfall of 386. The Highlanders, formed in 1994 by the merger of the Gordons and the Queen's Own Highlanders, is thought the most likely regiment to be under threat. Mike Rumbles, the Liberal Democrat MSP for West Aberdeenshire and Kincardine, said the UK was increasing its defence commitments. "This is not the time for a defence review and it is certainly not the time to hit the Scottish regiments," he said. Fergus Ewing, the Scottish National Party MSP for Inverness East, Nairn and Lochaber, said: "It would be utterly shortsighted to scrap a frontline regiment like the Highlanders at a time of massive international instability, especially when commitments across the globe have stretched the army to the point that TA units had to be deployed in the Gulf. "Politicians of all parties must unite to repel Whitehall's bean-counters." A spokesperson for the Highlanders said: "We are very well recruited and due to go on a tour to Germany next year. "There is absolutely no thought of disbandment or any further mergers." "Now the Highlanders could be under threat"